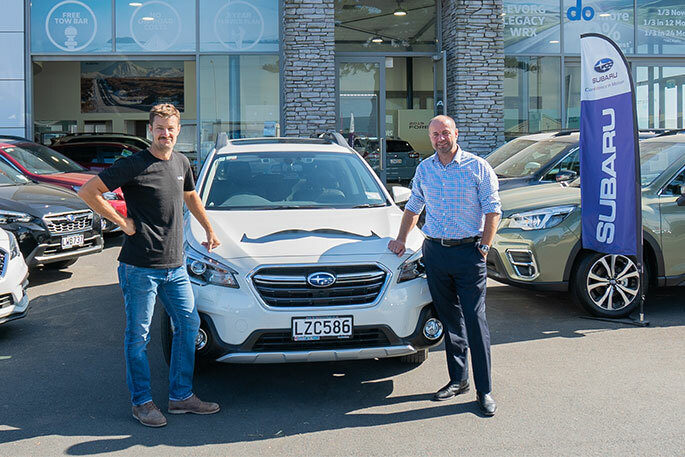 The family-owned Bay of Plenty business has supplied Subaru’s most-popular SUV - the Outback - to the Movember team, as the charity goes about changing the face of men’s health. The Movember Foundation addresses some of the biggest health issues faced by men: prostate cancer, testicular cancer, mental health and suicide prevention. Farmer Autovillage Group Managing Director Mike Farmer says the Tauranga dealership, which is approaching nearly 30 years of operation, is proud to partner with the Movember Foundation. “The team at Farmer Autovillage are passionate about our association with the Movember Foundation. Movember is not only just about prostate cancer, it’s about men’s overall mental and physical heath, which unfortunately, is too often over-looked in our society. “The Bay is one of New Zealand’s fastest-growing and most innovative regions and also one that has been extremely supportive of Movember and our mission to help men live happier, healthier and longer lives. Our partnership with Farmer Autovillage will ensure we can talk to and help more men in the region." The spacious, All-Wheel Drive Subaru Outback has proved to be the perfect SUV for his team, Mr Dunne says. “The vehicle support of the Subaru Outback has made a huge improvement to our day-to-day business. Often in the same day, we are required to attend corporate meetings, set up large events or visit a Movember supporter in regional New Zealand. "The Outback is such a versatile vehicle, which switches between these roles with ease - from the motorway, to parking in the busy Bay of Plenty region, often with a huge amount of kit in the back. It is great to drive and already the vehicle and the branding have created opportunities for the upcoming Movember fundraising campaign." Along with its well-publicised mo-grow over November to raise money and awareness, the Movember Foundation also finds and funds the most innovative research to have both a global and local impact. It is independent of government funding, so the foundation can challenge the status quo and invest quicker in what works. In 15 years, the Movember Foundation has funded more than 1200 men’s health projects around the world. By 2030 it vows to reduce the number of men dying prematurely by 25 per cent. From humble beginnings back in 2003, the Movember movement has grown to be a truly global one, inspiring support from over 5 million Mo Bros and Mo Sistas. Mo Sistas are women who sign up, start a team, commit to move, and fundraise– they do everything Mo Bro's do, they just don’t grow a Mo! Working alongside the Movember Foundation, the Farmer Autovillage team have exciting initiatives planned for 2019. Make sure you are following Farmer Autovillage on Facebook for updates on this exciting journey.